An artist's illustration of India's Chandrayaan-1 lunar orbiter, which operated from October 2008 through August 2009. Powerful radar beamed from Earth has found a tiny Indian moon probe that last contacted its handlers more than seven years ago. Scientists used the radar to spot India's 5-foot-wide (1.5 meters) Chandrayaan-1 lunar orbiter, which studied the moon from October 2008 through August 2009. This computer-generated image shows the Chandrayaan-1 moon orbiter’s location when it was detected by NASA’s Goldstone Solar System radar on July 2, 2016. The 124-mile (200 kilometers) wide purple circle represents the width of the Goldstone radar beam at lunar distance. The white box in the upper-right corner depicts the strength of the radar echo. "It turns out that we needed to shift the location of Chandrayaan-1 by about 180 degrees, or half a cycle from the old orbital estimates from 2009," detection team member Ryan Park, the manager of the Solar System Dynamics group at NASA's Jet Propulsion Laboratory in Pasadena, California, said in a statement. "But otherwise, Chandrayaan-1's orbit still had the shape and alignment that we expected." The researchers used the 230-foot (70 meters) antenna at NASA's Goldstone Deep Space Communications Complex in California to beam microwaves toward the moon in July 2016. They then studied the radar "echoes" that bounced back to Earth using the 330-foot (100 m) Green Bank Telescope in West Virginia. Some follow-up observations were also made by the 1,000-foot-wide (305 m) radar dish at Arecibo Observatory in Puerto Rico. Radar imagery acquired of India’s Chandrayaan-1 spacecraft as it flew over the moon's south pole on July 3, 2016. The imagery was acquired using NASA's 230-foot (70 meters) antenna at the Goldstone Deep Space Communications Complex in California. This is one of four detections of Chandrayaan-1 from that day. These echoes picked out Chandrayaan-1, India's first moon probe, as well as NASA's Lunar Reconnaissance Orbiter (LRO). Finding LRO was less of a challenge and more of a proof of concept; it's an active spacecraft, so precise location data from the mission's navigators guided the search, detection team members said. Astronomers commonly use this "interplanetary radar" technique to detect and characterize asteroids. 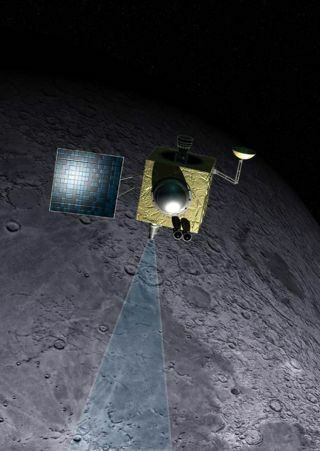 But employing it to find a lost probe in lunar nd-based radars could possibly play a part in future robotic and human missions to the moon, both for a collisional hazard assessment tool and as a safety mechanism for spacecraft that encounter navigation or communication issues," NASA officials wrote in the same statement. The $504 million LRO mission launched in June 2009. The probe worked for about a year as a scout, gathering data that may be useful for future crewed journeys to the moon; it shifted to more of a pure-science mode in September 2010. The Chandrayaan-1 also included an impactor, which was released from the orbiter in November 2008. The impactor's violent arrival on the moon in November 2008 revealed evidence of water ice on the lunar surface. India aims to launch its second moon mission, Chandrayaan-2, in early 2018. The mission will consist of an orbiter, lander and rover. NASA's 230-foot (70 meters) antenna at the Goldstone Deep Space Communications Complex in California.